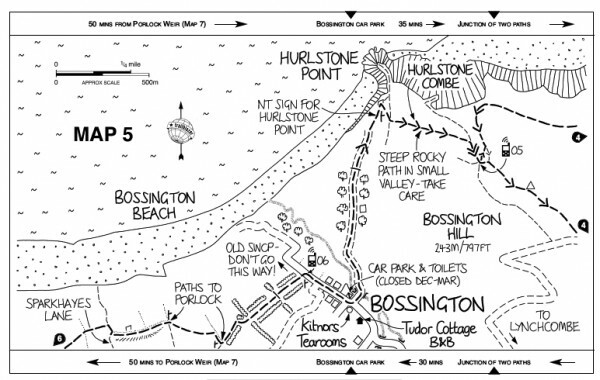 As walkers ourselves we know the value of getting the highest scale maps and most informative guidebooks for your walk. Make sure any guidebook or literature "pack" you are offered elsewhere is as thorough as our options. The most common complaint we hear about other walking holiday operators, is that cheap and basic literature with no supporting notes was supplied. This ends up with you wasting your holiday time on needless searches for facilities and meals or confusion about which way to go to stay on the trail. Highest Scale OS Explorer Mapping Included - Ask any experienced UK walker and they will tell you that 1:25000 Explorer OS mapping is the only choice for UK Walking. The highest scale, best detail, most recently updated and reliable - this is what the Emergency Services work from ....so you should have it. The latest advances here are the new Adventure Map Booklets from A-Z Maps, designed for National Trail Walkers and without doubt these will become the standard for all walkers over the next few years on The South West Coast Path, Wales Coast Path, Dartmoor, Exmoor and all other National Parks. Put Simply, The Adventure Map books reproduce the accuracy and quality of OS Explorer mapping but are indexed within a single book. So you get the best and most detailed information for you walk in a walker friendly format that takes away the problem of needing to keep on folding and re-folding a large sheet map. Easy to Use - Less bulk to carry, easy to get in and out of your pocket and with its index much quicker to use to find your location and then follow the route, yet with no compromise on the OS Map Scale or detail. Economical - One A-Z Adventure Map Book covers up to four OS maps for the same price. 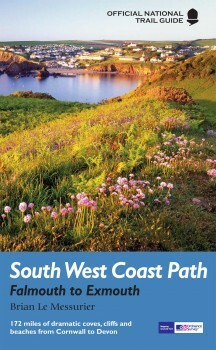 For instance the 630 mile South West Coast Path is mapped by 4 x A-Z map booklets - that's £40.00 in total. With fold out OS maps you need 16 to cover the same route an outlay of £128 – A-Z gives the same maps but at 1/3 of the price ! 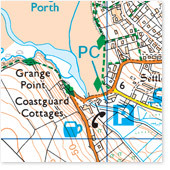 Safety - Many companies try to cut costs by arguing you can use the OS Strip mapping in the Trail Guidebooks - however this is only useful up to a point as its limited to one mile narrow strips along the coast path route. Its fine until you meet any diversions, need to head inland to find facilities (pubs for instance !) or want to take side trips to see something of interest. Worse still, in an emergency or bad weather you can't rely on it to cover to the nearest village or road head. A-Z maps stretch many miles inland giving you everything you need if the worst should happen or if you want to head a short distance inland from the path. Extras - A-Z maps include a full index of towns, villages, hamlets and locations, natural features and nature reserves so you can easily find locations along the path. Each entry has a page reference and a six figure National Grid Reference making it easy to find what you are looking for and also tell people where you are in an emergency. There is also a really useful linear breakdown of mileage points along the route covering pretty much every village and noteable point - no more guessing how far to the next village. You also get information on what facilities you can expect to find in these locations, on ferry crossings and for those who walk with their mobile phones there are QR codes that can be scanned to take you to more information covering everything from up to date Local Weather Forecasts and Trail Updates to Emergency Information. Rest assured that for any walks where A-Z maps do not currently provide an Adventure Book (such as on The Saints Way, Two Moors Way and Smugglers Way), we will provide the full OS fold out maps as previously. For all other routes however we are happy in the knowledge that we are providing you with the A-Z Map Books and so are giving you the best naviation materials. Of course its your walk …your way... so if you prefer to have the old style fold out OS maps we will still be stocking them as an option - but on a wet and windy day at Hartland Quay we think you too will be as sold on these as we are when we walk. Guidebooks for our Walking Routes. 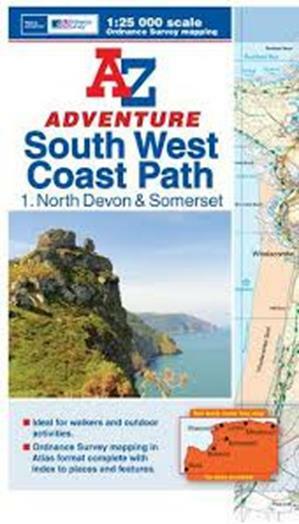 Its taken us years to arrive at the best option but to support the maps, we provide the Trailblazer Coast Path Guidebooks for all our Coast Path walks now as standard. These are written by walkers for walkers and have huge amounts of information that will save you time on your walk and make sure you get the most out of it - from where to find a cash machine to recommendations for the best place to eat in each overnight location. Sections on flora and fauna, public transport, town plans for overnight stops, information for foreign visitors, history, local festival information and much more all add to the value of these superb guidebooks. In addition and invaluable, these guides also have the whole path covered step by step with useful sketch maps that are of a higher scale than any other map option. This helps cover any of the tricky or confusing sections on the ground by noting prominent markers or navigation points for walkers (i.e. - steep flight of stone steps, old red barn) things that no normal OS map or GPS can reveal. 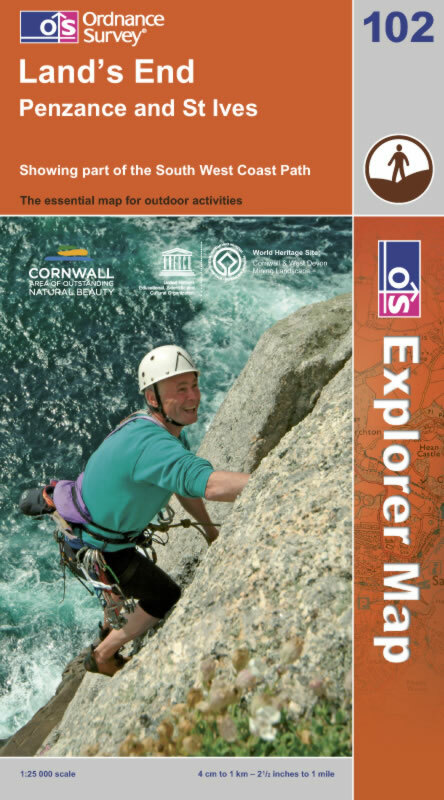 Used with the standard Explorer OS mapoing to give you inland and contour information we are confident that our map and guidebook package is by far the best you can get for not only finding your way on the coast path but also for getting the most out of your overnight stays whilst on route. Full Resources for all other Routes - All other routes have specific guidebooks or trail notes which we supply and these will be listed for you on your quote - this includes The Saints Way, Smugglers Way, Two Moors Way and Dartmoor Way. These are supplied with the full scale OS Explorer Mapping so you have the most detailed information to hand. One or two routes such as The Bodmin Moor Ten Tors route or The St Michaels Way have no published guidebook at all - in which case our own detailed route navigation notes are supplied to use with the OS Maps. Every walker with us receives their own day by day itinerary covering everything they need to know about their accomodation, how to find it from the trail, contact details and the facilities it provides. Each walking day is covered in detail with information about average walking times, distances, places for refreshments on route and points of interest to look out for along or close to the trail. There are always taxi numbers in case you need to finish the days walk early for any reason, details on who is moving your luggage and how to contact them as well as how to get to and from the trail, where to park your car and any other information needed for your holiday to run smoothly. Each itinerary is unique to you and to your walk and we supply it as a PDF file so you can download the itinerary, print spare copies or email it to those you have left at home so they know where you are every day. CLICK HERE to view a PDF example of one day of an itinerary from The Lands End Way showing the detail we supply. Your Choice of Guidebooks - As ever whilst we make recommendations on the best options we also offer complete flexibilty - if you prefer to have the more basic National Trail Guidebooks, or indeed any other Coast Path guide then you can choose not to take our recommended options, have the costs deducted from your booking and just use or order your own materials. If you are not sure - ask us for help and advice - we know the strengths and weaknesses of all the guidebooks and mapping options currently available for our routes.